We all love the way wine makes us feel, don’t we? More confident, stronger and able to take on the whole world. But there is more to wine than just making us feel happy. Red wine benefits are numerous and many of them are because of resveratrol which is found in the skins and seeds of grapes. During fermentation, red wine has extended contact with the skins of the grape which is why it has higher levels of resveratrol. These elevated levels of resveratrol are what actually increases red wine benefits. It is well known that a glass of wine a day keeps the doctor away. Therefore, when consumed moderately, red wine may help prevent heart disease by increasing levels of high-density lipoprotein cholesterol and prevent against artery damage. It is believed that resveratrol has many benefits which will help you age more gracefully. It has antioxidant properties which protect the body from damages such as cancer and heart disease. Because of its great health benefits, many manufacturers have decided to profit by selling resveratrol supplements. Some of these pills are made form the Japanese and Chinese plant Polygonum cuspidatum and others are made from red grape extracts. Manufacturers boast that the consumption of resveratrol stimulates weight loss and provides healthier and longer life. However, the question that arises is whether resveratrol pills really have that effect or are they nothing more than a marketing hype. Many studies has been conducted on animals and have proven the great effects of this supplement. However, keep in mind that all those researches have been done on animals, and not on people. Research in mice given resveratrol indicates that it might help protect from obesity and diabetes which are great factors for heart disease. Nevertheless, it is not recommendable that you take resveratrol pills because these findings were reported only in mice and not in people. More research is needed in order to truly establish the effects of this supplement. 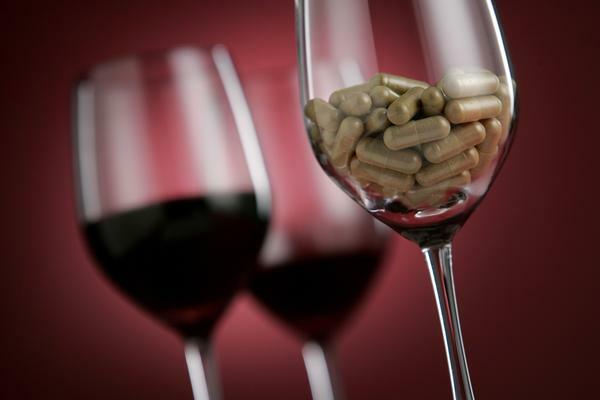 Do not forget that the effects of resveratrol last shortly after drinking red wine, thus the effects of resveratrol pills may not last in the long run. Many researches showed great results with small amounts of resveratrol, like that found in a glass of red wine. The Linus Pauling Institute has an interesting table that portrays the levels of resveratrol in various wines, showing that an average glass of wine ranges from 0.2 to 2.0 mg. On the other hand, a typical resveratrol pill contains from 100-500mg per capsule. It is true that sometimes less is more. Researchers are on their way to find out how much of a good thing, in this case resveratrol, is actually a “good thing”. Until the great effects of resveratrol pills on human beings are not proven, the safer thing to do to enjoy the red wine benefits is to have a glass a day.